On Monday the President and the First Lady of the United States of America Barack and Michelle Obama will arrive in Ireland on a brief visit. When the couple are at home in Washington they often eat out on a ‘date night’ at one of the capital’s restaurants. As they are in Ireland for a short visit, it is unlikely they will visit one of Dublin’s restaurants. Almost two years ago when they were on a trip to the French capital they ate with friends at a Parisian bistro. This was somewhat controversial at the time, as the US president, had turned down an invitation to dine at the Élysée Palace with President Nicolas Sarkozy while he was in Paris. 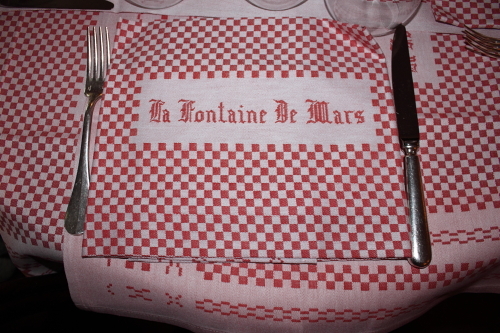 The bistro in question was La Fontaine de Mars which is at the Eiffel Tower end of the Rue St Dominique in the seventh arrondissement. I know the restaurant as it is stones throw from where I stay when I am in Paris and I have eaten there on several occasions. The food is good but it is not my absolute favourite eatery in the neighbourhood. 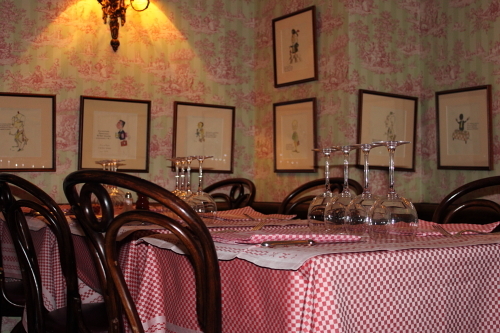 As French bistros go, this one is straight from central casting; dark wood, a laid-back ambience, knowledgeable friendly staff and the tables festooned with stiffly starched red and white check tablecloths and napkins. In warm weather there are tables on an attractive terrace on one side of the bistro overlooking a fountain. Inside the real buzz is downstairs. Even though the restaurant was closed to other diners when they were there, the Obamas choose to eat upstairs in one of the pretty rooms. Prices are moderate. At lunchtime there is a plat du jour for twenty euro but be warned adding on a glass of wine, something from the desert menu and a coffee will push the per head lunch cost to forty euro. 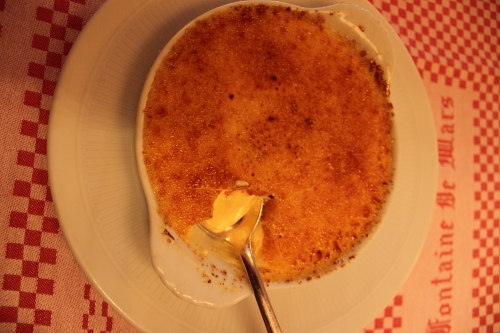 Last time I was there I finished my meal with crème brûlée and it was divine.